With Korea already on its way to becoming the next major front in world trade and international commerce--it is now the United States' seventh largest bilateral trading partner--American firms that realize the potential opportunities of establishing an early presence there stand to realize substantial profits. 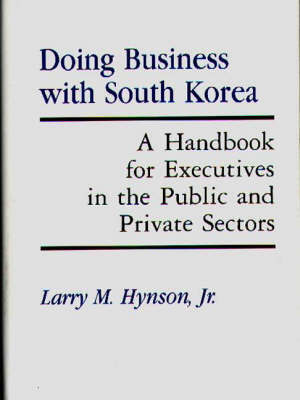 This pioneering book is the first to provide a step-by-step guide to establishing an active export operation in Korea. Writing for both business executives who want to expand their export operations and professionals who study and analyze international trade, the author offers a thorough discussion of company evaluation, product selection, overseas business practices, local customs, and Korean outlets. The focus throughout is on the practical strategies and procedures involved in setting up and maintaining a successful export operation in Korea, making this an indispensable source for international sales managers, strategic planners, and marketing executives. The author begins by analyzing company strategies and shows how the individual firm can evaluate its own export capacities. The second section discusses products and product groups likely to sell well in Korea. Part III places trade within its social context and explores Korean trade policies, the importance of culture, and the dominance of government in Korean trade. Because exporting trends are moving toward joint-ventures, the author notes, these cultural considerations take on additional significance. The cultural practices that must be observed by traders active in Korea are examined in a group of chapters that describe how the Korean import market works, how U.S. suppliers compare with Japan, how to gain access to the Korean markets, and how insiders view Korean practices. The last two sections emphasize Korean protocol and outlet procedures. Among the topics covered here are customs and traditions, Korean business etiquette, establishing distribution systems, consumer markets, service outlets, and business prospects. Numerous tables and figures amplify points made in the text.